Swarms of honey bees can look frightening, but honey bees are usually not aggressive at this stage of their life cycle. The swarming bees lack a hive to defend and they are more interested in finding a new nesting location for their queen. 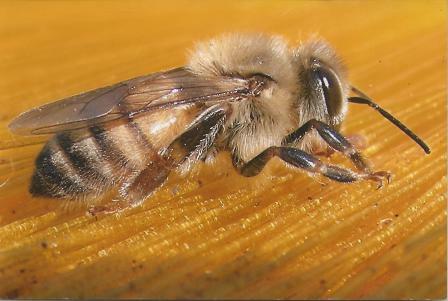 Before calling a beekeeper to collect a swarm or colony from your property, be sure you are dealing with HONEY BEES. 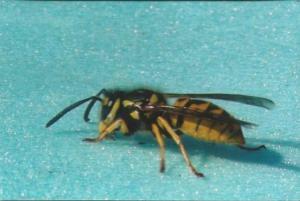 Honey Bees and Yellow Jackets are often confused — beekeepers will not retrieve yellow jackets. Use the photos here to help identify if you have honey bees. Beekeepers are often called to capture swarms. There are various methods to capture a swarm. In the first few hours after a swarm arrives and forms a cluster, it is relatively easy to capture the swarm in a box. Some beekeepers use swarm traps with pheromone lures to attract swarms. It is best to call a beekeeper as soon as possible since there’s no way to know how long they will remain. Holger Junge (Battle Creek, MI) Free honey bee swarm removal in Calhoun, Eaton, Kalamazoo, Jackson, Hillsdale, Branch and Barry Counties. Removal of colonies from structures and trees for a fee. Wayne Kramer (Richland, MI) Free honey bee swarm removal in Northern Kalamazoo, Southern Barry and Southern Allegan counties. Sorry – no bees removed from walls of buildings or trunks of trees. If you don’t find a beekeeper on this list who serves your area, please call your Michigan Beekeepers Association District Representative who will help you locate a local beekeeper. Click the link for a list.